I love reading to my kids. As I was pondering the kinds of gift guides I would share with you all this year I just knew that I wanted to do a reading centered one. I saw a little picture on facebook the other day of a bookstore front that had these words painted on the window, “There’s no app to replace your lap. Read to your kid!”. I LOVED it. It is so very true, and I know you fun parents and grandparents who enjoy my blog feel just the same way as I do. Happy reading friends (and happy shopping!). I’m a big fan of “collection” books. This book was gifted to me by my dear friend Katie Olmstead when my oldest was born. It’s one of my very favorite books. We have loved this book nearly to death, and it actually no longer has a front cover on it. This book has all kinds of classic fairy tales in it, the illustrations are varied and beautiful (lots of different art styles), and the story lengths are just perfect for bedtime, not too long and not too short. I love this book. I also love hearing different versions of popular tales, it’s as much fun to read as it is to listen to! I’m planning on getting a fresh copy for my kids for Christmas this year. I got this Christmas collection story book from the library a few years ago and loved it so much that I had to get a copy of my own. It’s an older book and not as easy to find, but it’s well worth the hunt. I adore having seasonal stories to read to the kids. I keep this book stored in my Christmas decorations so when we get things out it’s there waiting for us and feels new all over again. You will love it! Again, this book has great pictures, is fun to read, and the story lengths are just perfect for bedtime reading. I’m a big believer in reading chapter books to the little ones, even if they don’t understand everything. The Little House on the Prairie box set is one of our all time favorites. The chapters are each a little story so it’s easy to start and stop again without having to do a lot of remembering where you were. I really enjoy reading these out loud. The stories are told through Laura’s eyes and she’s so fun at telling details and making you feel like you are right there with the Ingalls family. They are classics through and though. I think every family should have these books on their shelf. I actually didn’t read this series until I was about 25, so it’s a good read for just about anyone, not just the kids. I picked up this set for my kids last year and we are still really enjoying them. The set I have has 10 hardbound books and they come in rainbow order in a nice box set. So not only are they great books but they look fabulous on the shelf. This set includes Black Beauty, Peter Pan, The Call of the Wild, The Wind in the Willows, The Adventures of Robin Hood, The Secret Garden, Huckleberry Fin, and Anne of Green Gables. I have linked to it on Amazon so that you can see it but I don’t recommend buying it there. I got it though the book order at school for $60 and after telling a friend, she found it on Zulily.com for the same price (which is almost $100 less than what Amazon is selling it for). This set was just so full of classics that I had to get it for the kids for Christmas and I am so glad that I did. Their dad read out loud The Adventures of Robin Hood (and the little boys LOVED it!) and I’m readying Black Beauty to them now. It’s been so fun to have some really great stories to read out loud to them and I know one day they’ll be reading them on their own. Not a book but such a fun little thing to have. Headlamps would be a perfect little stocking stuffer for your readers. We love having reading parties in a tent, under the boys’ bunk beads, or in the closet with our headlamps on. Don’t ask me why, but reading with a little light on is so fun. This is a must have for any family. Plus they are really handy for more than reading in the closet too! Every good book needs a snuggly blanket to go along with it! I bought one of these beautiful hand-stitched blankets last year and I’m so glad that I did. Here’s how the company Dignify explains their blankets and what makes them so special. Wow. That’s definitely the kind of company I want to support. I don’t know if it is how the blanket is made, or my emotional ties to it, but it has some very serious good juju going on. It’s the blanket the kids always find, the one the baby sleeps under and plays on the best, and it just feels like happiness and hope. I’m thinking about getting a second one for this year. I highly recommend these blankets and the company behind them. Did I mention how pretty they are?! When it isn’t bed time and I’m just reading a chapter book out loud to the kids I have found that it works best if they have a little something to keep their hands busy while I read. We love wooden train tracks and they are often what the kids choose to get out while I read. They can play while I read for a solid hour. The wooden train sets are easy enough for them to put together on their own too; I don’t have to stop reading to help. We love the Brio brand. If we aren’t getting out train tracks we are reaching for the Duplos. Duplo blocks are chubby Legos that are just perfect for younger kids. We have plenty of the little Legos but all of my kids still really love playing with this size of blocks. It is easier (and quicker) to get something built, but they are small enough that the kids still have a lot of creative freedom with them. I got a Duplo train set at a hardware store last year and we love it. I’ve also had lots of luck buying assorted “lots” of these on Ebay. Who doesn’t need this?! LOL! I have actually never bought anything from Land of Nod but I’m pretty obsessed with the site. They have so many neat things for kids! I thought this would be the perfect thing to lounge on and read. Isn’t it cute! A lady can dream right. This teepee is also a “one day” item. I don’t have the space for it right now but they are just so very cute. I plan on buying/making some kind of teepee when we get our house built. I can just imagine all of the hours of play that would center around this simple little fort. Bonus, it sure looks like they fold up and hid away pretty easily too. One day, one day. And there you have it! Some of my favorite (and big dreamer) items that every parent who loves to read to their kids needs. Disclosure: The links to Amazon are affiliate links (the links to the other place are not affiliates). If you make a purchase through my link then I get a small kickback for referring you. It doesn’t change the prices at all for you, but it sure is fun for me to get a few extra spending dollars this time of year! Thank you for supporting me in all these fun blogging activities. Melissa, what a sweet post! I love that you included a dignify blanket and I love even more how you describe your family using it!! 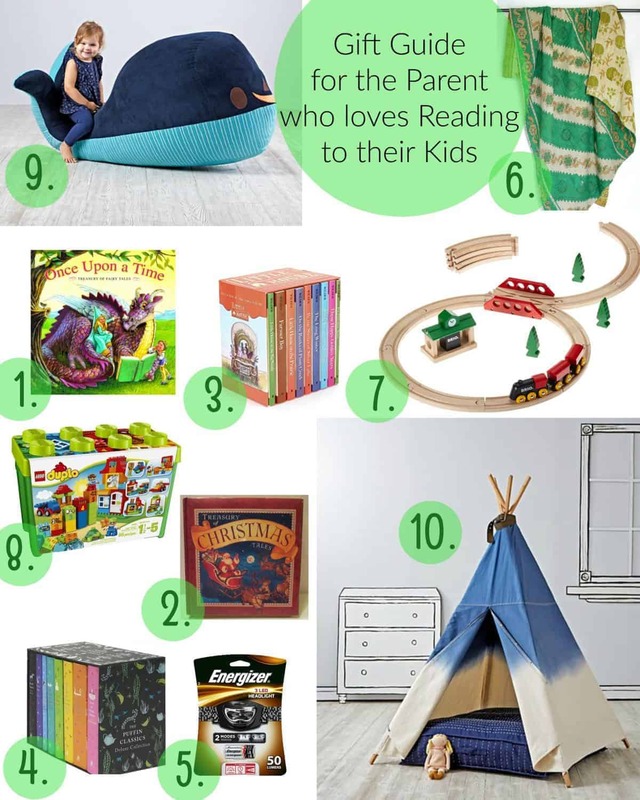 We are also a huge book-reading family, and I think that the toys for the younger kids idea is genius. I also find that listening to an audio book (right now: Anne of Avonlea) is a way for my oldest daughter and I to enjoy sharing the “reading” experience, while I can sit and color or play cars with the littler ones.